Pre-order for 'The Extra Dimensional Wound' now available HERE; hits streets May 25! LA underground black metal act, LIGHTNING SWORDS OF DEATH are pleased to release the track listing and cover art for the band's upcoming Metal Blade debut The Extra Dimensional Wound, out May 25th. 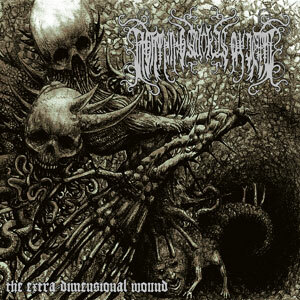 The Extra Dimensional Wound was recorded in Corona, CA at Trench Studios with Roska from the band producing and John Haddad handling engineering duties, and was mixed and mastered by Sverker "Necro" Widgren at Necromorbus Studios in Stockholm Sweden. It began seven years ago when a pact was made within a dilapidated house hidden in Southern California. It was here that Autarch, Roskva and Menno found themselves in agreement that should the occult sciences be applied to music, the results would prove extremely dangerous to their sanity, yet yield spectacular results. LIGHTNING SWORDS OF DEATH, as they would name it, would be in itself a meticulously designed hyper-sigil constructed to direct and antagonize the limitless dark energy that lurks within the less navigable chasms of the human mind and the space between spaces. 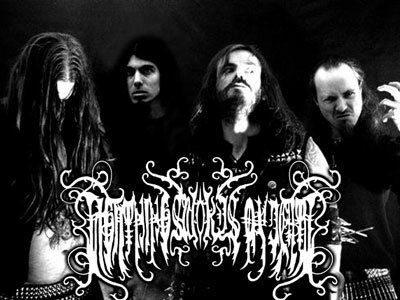 Enter 2009; LIGHTNING SWORDS OF DEATH signed a worldwide deal with Metal Blade Records and continued to push their brand of brazen black metal through their DYI attitude, getting multiple tracks on the PSP game UNDEAD KNIGHTS as well as a track featured on the soundtrack for the horror/thriller movie Stepfather (October 2009). LIGHTNING SWORDS OF DEATH budding reputation as a relentless and must see black metal act also earned the band a coveted spot on the Evangelia Amerika Tour, headlined by Behemoth and joined by Septicflesh of Greece, which kicked off in January 2010. In anticipation of the release of the band's debut Metal Blade album The Extra Dimensional Wound the band toured the western and southern US during March 2010 with none other than Kreator, Kataklysm, Evile and Lazarus A.D. LIGHTNING SWORDS OF DEATH even landed a highly sought after spot opening up the Los Angeles show for legendary black metalers Immortal! "Contrary to popular imagination, one does not have to be from Norway to make a decently blasphemous metal record…a chaotically grim speed-fest with riffs alternating pace between a lurching crawl and a frenetic tornado. The Norwegian influence is definitely more predominant here, though thankfully it has the precision and grit that most classic black metal albums consciously left out."